Definition and description of the Tambourine: The Tambourine can be described as a small drum, especially a shallow drum with only one skin, played on with the hand, and having bells at the sides. The tambourine consists of a flat wooden or metal ring, over one end of which is stretched a parchment or vellum head. In the circumference of the ring nine or ten metal disks or small bells are fitted which jingle as the tambourine is struck by the hand, or just waved through the air. The tambourine dates back to antiquity and was known at different times under the names of timbrel or tabret, tympanon or tympanum. This musical instrument was traditionally used by women as illustrated in the picture below. Family of Instruments: The Tambourine belongs to the family of Percussion instruments. 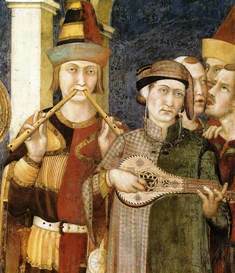 Medieval Musical instruments, including the Tambourine, would be used by the musicians of the period including the Waits, Minstrels or Troubadours. There were three categories of musical instruments in the Middle Ages - wind, string and percussion. Terms of description were Bas instruments and Haut instruments. Bas referred to soft instruments (literally, "low," but referring to volume, not pitch) which were suitable for the chamber which included the vielle, rebec and other bowed strings, the lute and other plucked strings. Haut referred to loud instruments (literally "high" but referring to volume, not to pitch) which were suitable for outdoors which included the shawm, sackbut, pipe and tabor. Read the above history, facts and information about the Tambourine. The Medieval Times website provides interesting facts, history and information about the musicians and styles of music which scatter the history books including Tambourine. The Medieval Life and Times Sitemap provides full details of all of the information and facts about the fascinating subject of the lives of the people who lived during the historical period of the Middle Ages. The content of this article on Tambourine provides free educational details, facts and information for reference and research for schools, colleges and homework for history courses and history coursework.